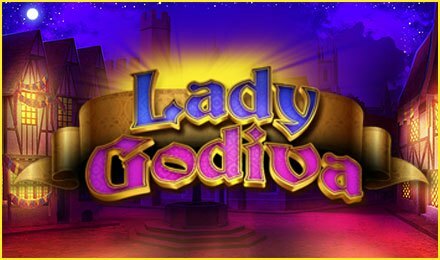 Meet a brave and lovely lady known as Lady Godiva on the reels of Lady Godiva Slot at Wicked Jackpots. Created by Pragmatic Play, it consists of 5 reels and 20 paylines. As you spin the reels, get the chance to see the most beautiful ladies and most handsome men. Play this slot on any type of device like desktop, mobile or tablet. On the background of Lady Godiva Slot, catch glimpses of wooden houses shining bright from the lights inside. The snow is falling and it is night time. In this way, relive the story of Lady Godiva. On the reels, there are symbols like: A, K, Q, J, White Horse, Peeping Tom, Leofric Lord of Coventry and Lady Godiva. Begin your game on Lady Godiva Slot using the + and – buttons to set your bets. Make the most of the Auto Play feature to enjoy 10, 20, 30, 50, 70 or 100 games played without any intervention. Make combinations of 3 or more similar symbols on the paylines to win. Amount of Paylines Selection: The 20 paylines cannot be modified. Coin Values: The default coin values are: £0.01, £0.03, £0.05, £0.10, £0.20 and £0.50. On Lady Godiva Slot, all the symbols along with the Wild are fully stacked and fill the entire reel or one or more reels. Lady Godiva represents the wild symbol, replacing all other symbols apart from the Scatter. The Fleur de Lys stands for Scatter. It helps to activate the Free Spins Feature. 30 Free Spins + 1x Multiplier. 15 Free Spins + 2x Multiplier. 10 Free Spins + 3x Multiplier. 5 Free Spins + 6x Multiplier.